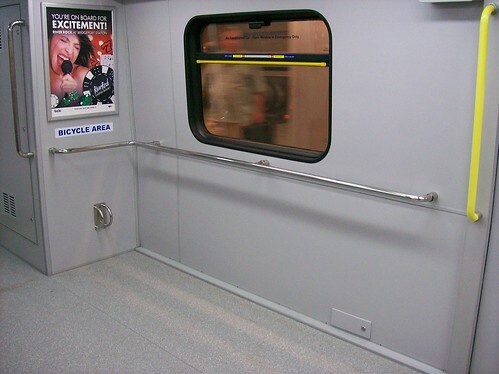 This is a bit belated, but I did managed to get over to Vancouver for the opening of the Canada Line, the newest addition to the SkyTrain network. First, a little bit of history. The Canada Line is a Public-Private Partnership, something that the BC Gov forced onto Translink as a condition of provincial funding. This means that it is actually operated by ProTrans BC and was built by InTransitBC, both largely owned by SNC Lavelin out of Montreal. 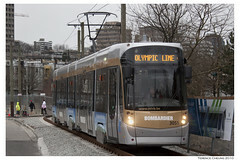 The federal government demanding Translink call it the Canada Line as a condition of their funding. That being said, Vancouver is the first Canadian city to have a direct rail link to the airport, something common in Europe as well as a few US cities like Portland. Given I was coming from across the pond, I ended up starting at the Marine Drive station, just north of the Fraser. This turned out to be a good decision, because lines for northbound (Waterfront Station-bound) trains were fairly quiet, at least in the morning. 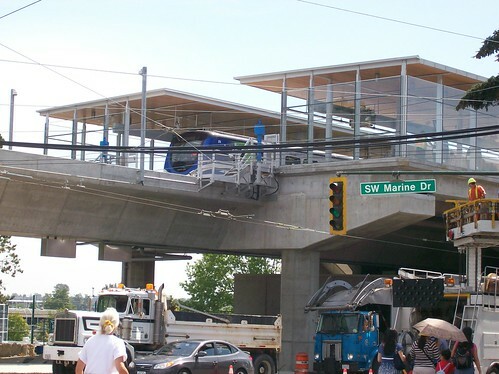 The Marine Drive station is pretty indicative of the elevated stations on the line. Lots of wood and glass. They were attractive, but the platforms were short, as can be seen in the second photo down, coming into one of the underground stations. The stations also seriously lacked amenities. There were no bathrooms and few chairs in most of the stations. The stairs were narrow, with only escalators going up. Overall, the stations felt quickly built and cheap, as attractive as some of them were. 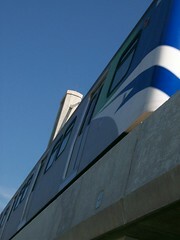 The cars themselves were fairly spacious, wider than the newer Mark II cars on the Skytrain. The had a single space for a bicycle and another for wheelchairs, both in one of the two cars. The ride was smooth and fairly fast, especially compared to the old 98 B-line “bus rapid transit” or the even older Expo Line. The Expo Line now has some sections of track cause a lot of noise and sway, especially with the older Mark I SkyTrain cars. One of the challenges with connections was that the bus lines haven’t yet been adjusted, something is coming with Labour Day. Both the 98 B-line and the 424 to the Airport are going away, while the 620 from Tsawwassen will be routed into Bridgeport Station. This is just some of the large number of bus changes coming, some of which are not making people very happy. Many people are now going to have to take both a bus and the Canada Line to downtown, as opposed to a single seat bus ride. 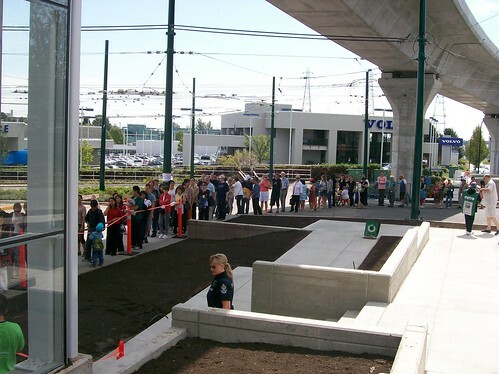 As can be expected for the opening of a major new transit line, the lines were crazy all day. 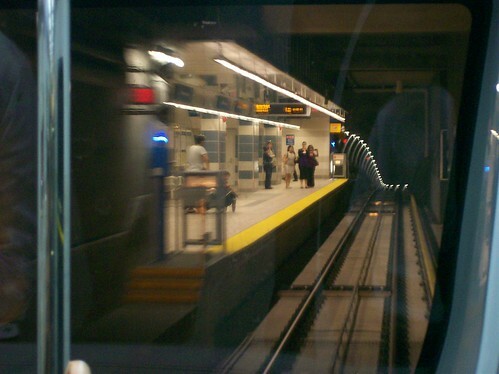 Waterfront Station was especially bad, with waits running past an hour, from what I understand. Overall, I am glad the Canada Line exists, but I think there are going to be serious capacity issues in the future. With the short platforms leading to inability to run larger trains, unlike the Skytrain system, expect crush capacity cars of 400 people very shortly. The real test will come this fall, so it should be interesting to see those numbers. To see more pictures, see my Flickr set. The Montreal bike-sharing program is coming to Vancouver, for one day at least. The Georgia Straight is reporting that this Friday through Monday there will a test of the bikes on the seawall near Science World as part of Bike Month in the Vancouver region. You can see a map and the hours on the City of Vancouver’s official page about the program. This isn’t the only place Bixi is spreading its wings to. Ottawa and Gatineau are also getting pilot projects, albeit a slightly more substantial one. This is run by the National Capital Commission (NCC) and comprises only 50 bikes right now. It is expected that if the pilot is successful, a larger rollout could come as early as 2010. Given we have our own version of the NCC here in Victoria, the Provincial Capital Commission, and we such a tourist destination, where is the bike sharing project for Victoria? A few stations around downtown including at the cruise ship docks would allow tourists to discover all the great biking facilities here in Victoria and also maybe help the poor James Bay residents sleep better at night by cutting down on the diesel exhaust from buses. I managed to miss this last month, but the province, BC Hydro and the City of Vancouver signed a deal with Mitshubishi to test a production-ready electric car, the MiEV. Unlikely the low-speed electric cars Oak Bay recently let on their 50 km/h streets, this is a highway capable vehicle, like the ill-fated GM EV1 and the sort-of-already-here Tesla Roadster. By this time next year, we should have quite a few production electric vehicles on the road, including this MiEV, the Telsa Roadster (although small quantities are available now) and the Chevy Volt. We do live in interesting times. A few days ago Vancouver was considering becoming an open city, embracing open source, open standards and open data. 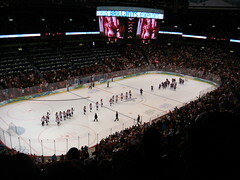 This week, that idea became a reality as Vancouver City Council adopted Andrea Reimer’s proposal. What does this mean in the short term? Likely not much. We are in the middle of a recession, which means there is probably little software aquisition going on and thus little new open source software. As open standards usually follow the software that uses them, little is likely to change on that front either. Which brings us to open data, where we will likely see the most immediate change. Much of the data that the City of Vancouver could release they have already collected, such as geospatial or demographic data. To get a good idea of the vast amount of information that becomes avaiable when a government takes the leap, take a look at this list about data.gov, the new US Federal government website dedicated to releasing as much data as possibly freely. In my own little part of the world, we in the OpenStreetMap community here in Canada have been collaborating with the federal government’s Geobase project to get their data imported into OSM. Sadly, much of the information there is second class, as provinces and municipalities keep their latest and greatest to themselves. Hopefully this decision, and the City of Toronto possibly following suit, will encourage more and more municipalities across Canada to realize that the value they will get from freeing their data and adhering to open standards far eclipses the lost revenue they might have gotten otherwise.